If you are thinking about breathing life into an old room, or creating a new space, consider how a special light from Allen’s Antique Lighting can enhance your project. Lighting selections are sometimes postponed when the budget may already be exhausted, along with you! We would love to help you complete your space with our dramatic antique lighting. In my opinion, Allen’s antique lighting is one of the premiere resources for historic lighting in the country. Their items are thoroughly researched and carefully conserved. The very rare early gas fixture we purchased from them retains its original finish and the Allen’s even provided the period correct burners. They are a pleasure to work with and I highly recommend them. Our experiences with Allen’s Antique Lighting have been ideal in every respect. The inventory initially seems overwhelming, both in terms of scope and quality, but Cindy quickly develops an understanding of her clients’ taste and provides a manageable range of excellent options suitable for the client’s stated budget, accompanied by background information (such as manufacturer (if known) , date and place of origin) on each piece for which the client expresses interest. We appreciate that Cindy provides this extremely attentive level of service, and that she and Chris maintain their meticulous standards for restoration, even for clients who are looking at the lower end of the price range. The lighting that we have purchased from Cindy and Chris is beautiful, warm, charming and fits perfectly with the other elements in our house. We couldn’t be more pleased. For over 35 years, Cynthia and Chris Allen have been helping folks do just that. 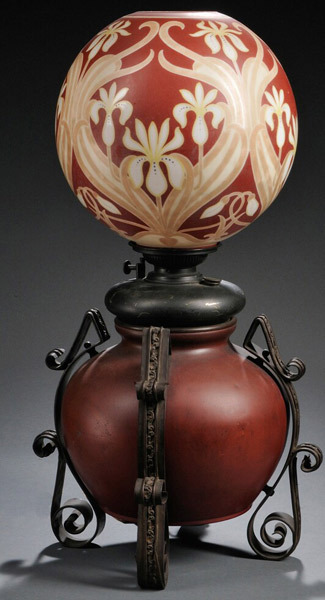 We offer one of the finest collections of antique lighting for sale in the world today. We are unsurpassed in the breadth and quality of our selection, our customer service, and our integrity. From functional to whimsical, our lighting will enhance any setting and will always be a wise investment. All of our lights are antique, both the metal and the glass, and are sold fully restored to your specifications. Each light receives museum-quality restoration, whether its maintaining an original patina or recreating a period finish. We believe every light we sell should look as if it was always cared for, rather than recently restored. We show less than 5% of our available inventory on our website. We hope you’ll call or email us to start the process and end with a great light for you to enjoy for another century or more. Illuminating a room can be an adventure with Allen’s Antique Lighting — own a bit of history! Allen's Antique Lighting also has a website of their own, filled with great examples of their work and more information about their business. See their website here.